Nathan Arnison (1795-1886) was a farmer’s son, born at Haresceugh, Renwick and in 1823 he settled in Penrith as a linen and woollen draper. Two of his sons, George & Thomas, joined him in the firm N Arnison & Sons in Penrith, another son set up Arnison & Co drapers in Sheffield and two other sons William Burra and Charles Nathan practiced at Arnison & Co Solicitors in Penrith. William Burra Arnison, having served his articles with Atkinson and Harrison Solicitors, Penrith was admitted to the roll in 1852 and at once commenced practice in Penrith on his own account. His younger brother Charles Nathan served his articles with him and in 1863 was admitted to the roll. 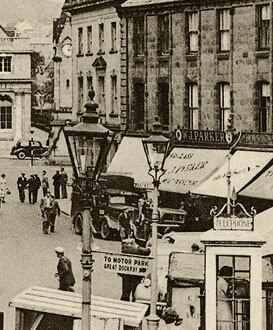 Arnison & Co at that time practised from an office in Devonshire Street, part of the premises of N Arnison & Sons, the drapers (next to the Woolpack pub), but in 1884 moved to larger premises in 1 St Andrews Place which had belonged to the Law family from Brampton. William Burra Arnison died in September 1896 without any male offspring and younger brother Charles Nathan Arnison took over responsibility of all the public appointments. Charles Nathan Arnison had three sons, two of which qualified as solicitors. Nathan Henry and Charles in their turn joined their father in Arnison & Co. Nathan Henry Arnison qualified in 1895 and Charles Arnison qualified in 1897. Between 1911 and 1920 the practice ran with brothers Nathan Henry and Charles in charge and they were joined by Charles’ eldest son Charles Eric Arnison in 1932. In 1935 Charles’ second son Thomas Mitchell Arnison qualified and subsequently joined Arnison & Co which was now run by four Arnison solicitors, but only ran on that basis until the 2nd World War broke out in 1939. Thomas Mitchell Arnison joined the 6th Battalion of the Border Regiment TA and unfortunately during the course of hostilities was made a prisoner of war. He rejoined Arnison & Co after the war on his return to Cumbria. Charles Arnison died in 1948 followed by his brother Nathan Henry Arnison in 1959 which left Charles Eric Arnison and Thomas Mitchell Arnison running the practice. In 1962 Arnison & Co appointed the first non family partner Tim Strevens followed by John Ryder in 1965. Charles Eric Arnison’s son, Charles Robert qualified in 1965 and joined Arnison & Co in 1970. Thomas Mitchell Arnison died in 1989 and Charles Eric Arnison in 1992 at the age of 91 and still practicing – he never retired. Charles Robert Arnison retired in 2001, the last Arnison of Arnison & Co. Sadly he died in 2007 aged 64.